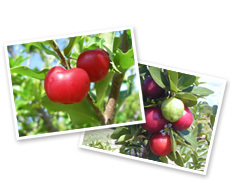 For more than 20 years, a lot of studies of acerola has been performed by Nichirei in congress presentations and publications. Some of them were written in English such as a report of acerola fruit in relation to cultivar, growing region and maturity, and acerola polyphenol functional effect as health claims. Bioscience, Biotechnology, and Biochemistry, 72, (12), 3211-3218, 2008. "Skin-Lightening Effect of a Polyphenol Extract from Acerola (Malpighia emarginata DC.) Fruit on UV-Induced Pigmentation."